A Collection of Hand Made Day of the Dead Folk Art from Mexico. Dia de los Muertos, Mexico's Day of the Dead, invests the participant in the fact that death is a constant companion from birth, an accepted friend to be joked and played with, perhaps because of the ironic foreknowledge of the fatal reality. Embrace the rich traditions of our Mexican neighbors and enjoy your date with destiny through our collection of Day of the Dead folk art. 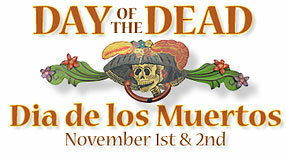 Our Day of the Dead skeletons, dioramas, wall art, ornaments, sugar skull molds and clay creations are all handmade in Mexico. Celebrate this rich tradition of Dia de los Muertos with these authentic Mexican folk art creations. Origins of Dia De Los Muertos.